If you have a Visa d’Etablissement and an accompanying Visa Sortie et Retour, you should get a CEPGL travel document, with which you can travel without a visa to Rwanda and Burundi. Another benefit for those that stay longer in the region is that your passport will no longer be stamped and you do not run out of passport pages. To get a CEPGL travel document, visit the immigration authorities DGM in Goma. Bring $12, your passport with copies of your first page, visa d’etablissement, and visa sortie et retour, as well as one passport picture. They will take a computerized picture of you so you’ll have to go yourself. It takes DGM two days to process your request. The document is valid for three months. Be aware that you will still need to travel with your passport as border officials will not let you cross the border with just a CEPGL certificate. Also, if you only transit through Rwanda or Burundi to go to another place, you cannot use your CEPGL. For a detailed explanation how to register a car in Goma (get a driver’s license, number plates and insurance), see here. You can rent cars in front of the MONUSCO hospital. (There are no more cars to rent in front of the post office). Always ask a driver whether he has all the papers (his driver’s license, insurance policies, and registration for the car), spare parts and necessary tools. A round trip to Rumangabo (2-hour drive) with a city car, for example, costs $100, incl. gas. It’s $150 for a land cruiser. If you want to rent and drive a car yourself in Gisenyi to explore Rwanda, I suggest you call Heri (+250 787 477 547), Shafy (+250 788 520 406), Gady (+250 788 637 335) or Green Hills Eco Tours (+250 722 220 000) to scout out options. One of the best shops in town is Kivu Motor. If you want to car pool to Kigali, post your request on the Facebook group North Kivu Life. 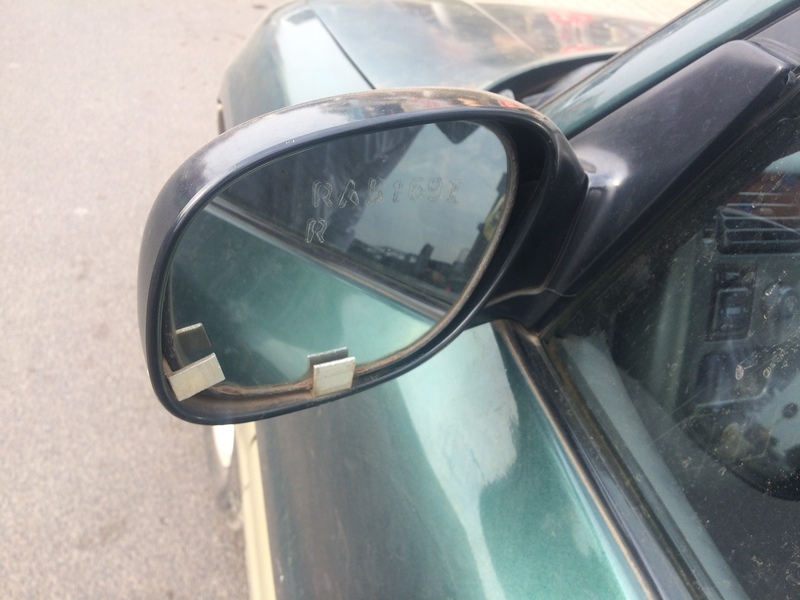 You should scratch your license plate number into your rear mirrors and/or screw small plates into the frame to prevent theft. It’s very common in Goma. You can buy a motorbike at Prodimpex, a distributor of Yamaha. The shop is located on Avenue Beni 29/09, Quartier Les Volcans, Goma. 081 210 1171, 085 890 1171, pixgoma@prodimpex.com. If you need to repair your motorbike, call Desiree from Yamaha at 099 549 2901 or Mustafah at 081 063 6657. Examples: Repairing a puncture is $2, motor oil is $5. You can buy a helmet for $180 at Yamaha. Numbers of motorbike drivers in Goma: 085 922 6059, 099 550 1772, 099 725 0361, 099 551 0078, 097 905 0506. You should make sure that your motorbike driver is registered carrying a vest with his registration number. Note that international staff of INGOs are often not allowed to use local transportation. Since early 2014, the city has public automobile taxis. While they are comparatively more expensive, they operate throughout the night. Numbers of drivers include 097 051 3411, 082 861 0902, 099 570 4602, 089 670 5846, 097 050 2940, 099 771 4348, 099 413 2886, and 099 137 9296. You will find most of them at the BEDGL roundabout. There’s a small bicycle shop in Gisenyi called Rwandan Adventures, selling 7-gear and 21-gear mountain bikes for $200 and $420 respectively. +250 785 645 478, – 786 571 414, – 786 571 414. The speed boat from Ihusi Hotel for $50, leaving Goma and Bukavu at 7.30am and 2pm. See schedule below. The journey will take you around 3 hours. Make sure to either be there 30 minutes earlier or reserve a ticket in advance as the boat is much in demand. 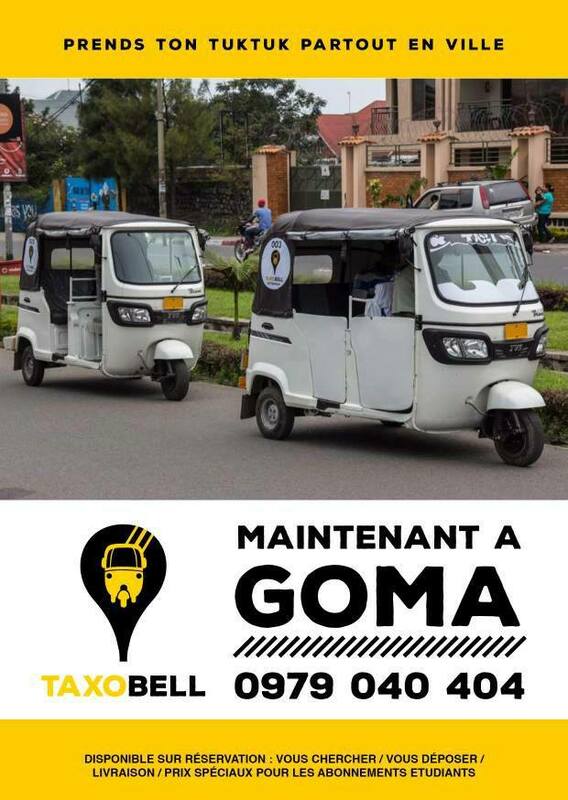 In Goma, call them at 099 481 3235 and 097 464 5680, or 099 776 3920. In Bukavu, you can reach them at 099 423 4071 and 099 882 1195. Mugote boat: $10 per person per trip. 099 440 0804, 085 305 0035, 099 896 2978, 099 775 7307. Emmanuel: $25/ride. Departs Goma at 7.30. 099 778 9295, 099 440 7879, 099 066 0541, fkaneza@yahoo.com. 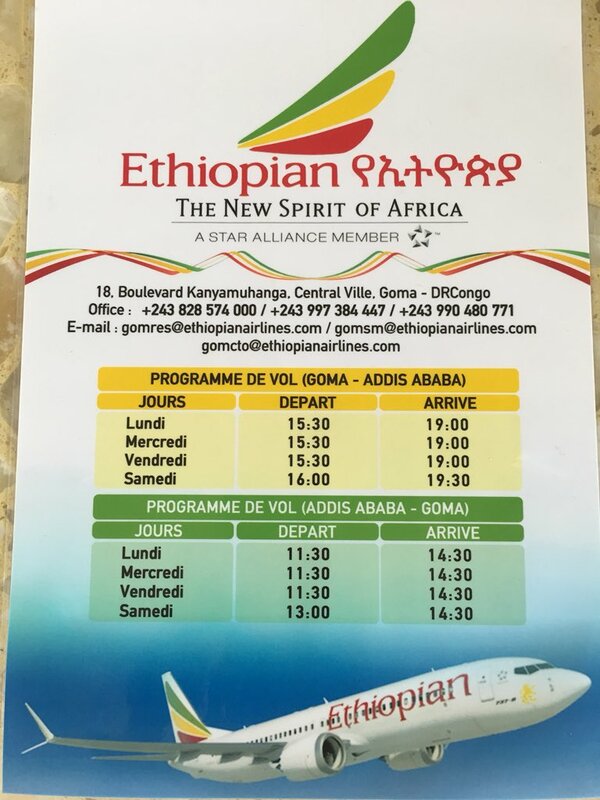 If you are flying out of Goma, make sure to bring enough money to pay airport taxes (see prices below) and your yellow fever card or risk a fine. 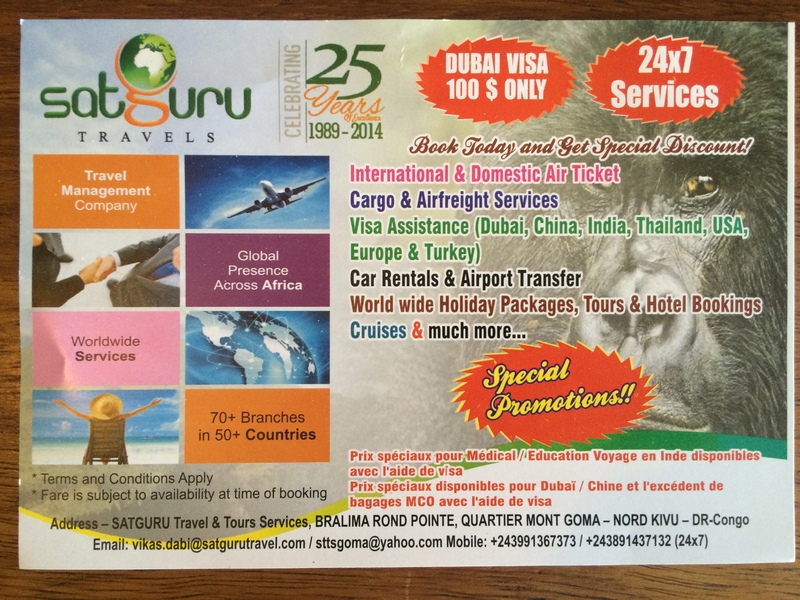 If you have trouble, call travel agent Ngoy at+243 997 703 194. Be aware that flying in Congo can be a dangerous undertaking. Most aid workers and journalist take free flights with MONUSCO or UNHAS. The airline CAA is located at BEDGL roundabout. +243 820 002 600/601/602; 099 590 3831, 099 590 3900, 099 866 5369, 099 866 8682, 099 386 0999, goma.escale@caacongo.com. CAA’s schedule is available on their website. Congo Airways is right next to TMB Bank. Mango airlines. Located close BEDGL roundabout in direction of the airport, right of Rawbank. 081 814 0879. 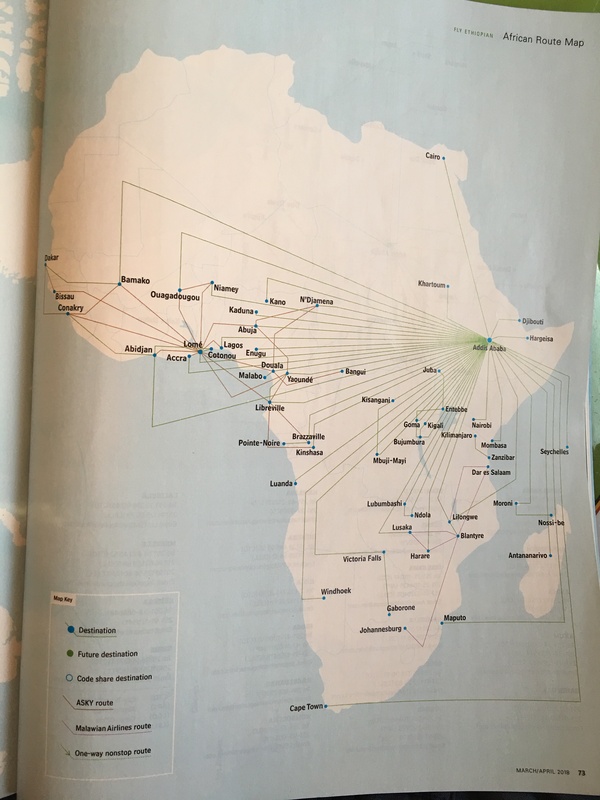 Ethiopian Airways has flights to Bujumbura and Addis Ababa from Goma. Caleb: 099 401 2433, calebkaban@yahoo.fr. Horeb Bulambo Shindano: 099 876 8411, oribshindano@gmail.com. Adolf: 099 580 8585, johnsonlukogo@gmail.com. Chrispin Mvano: 099 135 6572, africajp2006@yahoo.fr, baumamvano@gmail.com. Kenny Katombe: 099 438 8831, kennykat@hotmail.fr. Victor: 081 915 5582, victoranasa@gmail.com. Lunanga Stewart: 081 365 0630, 099 595 9576, Alc.drc@gmail.com, Amani Language Center (ALC). For translations he charges $50/day for students/researchers and $100/day for organizations. He translates documents for $15/page. Emmanuel Munganga Rufubya: 082 556 6810, 089 964 3595, +250 783 589 405, emmanuelrufubya@yahoo.fr. 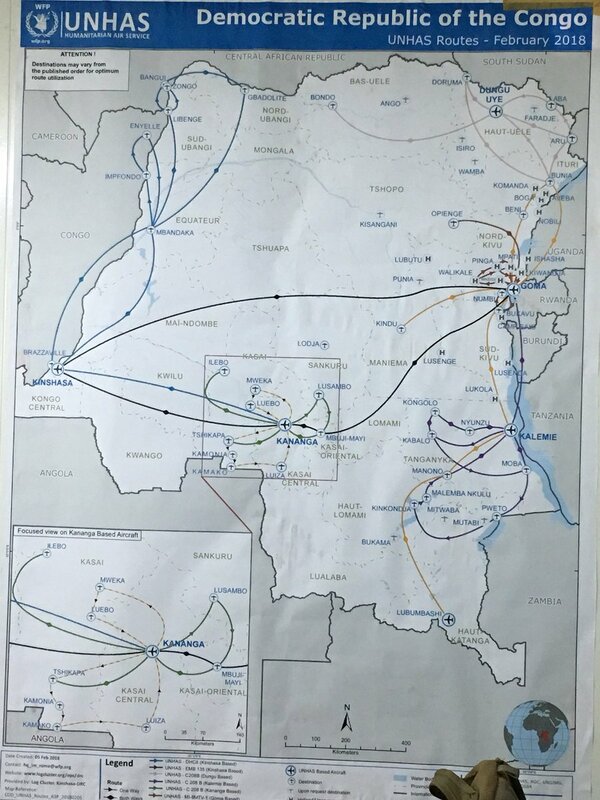 City map , road map for the Great Lakes Region, and distances in northeastern Congo. On Avenue Mont Goma, off the Chukudu/Bralima roundabout, you will find Satury, open Mo-Fr from 8-12.30h and 14-17h as well as Saturdays from 10-14.30h. Contact: 081 171 6116, 099 344 8137, 099 136 7373, +250 783 821 491, sttsgoma@yahoo.com, mahesh.aswani@satgurutravel.com, vikas.dabi@satgurutravel.com. Right next to Satury, you will find Jeffery Travels, open from Mo-Fr 8-17h and Saturdays from 8.30-13h. Contact: 081 827 1111, goma@jefferytravels.com. They will help you book flights and hotels, arrange visas, hire a car, etc. There is also Kivu Travel. Contact: 099 349 8376, info@kivutravel.com, guillaume@kivutravel.com. Hi. Could you go into a bit of detail regarding the free flights with MONUSCO? I’ve managed to find a timetable, but how do you get on a flight? Is there a list you have to get on etc? I want to go from Goma to Entebbe. Thanks in advance. Yes, cou8ld you please provide detail on how t orequest MONUSCO transport support? Kilolo Sylvestre. 994 150 747.